These entries were featured at the FLOAT Forum. 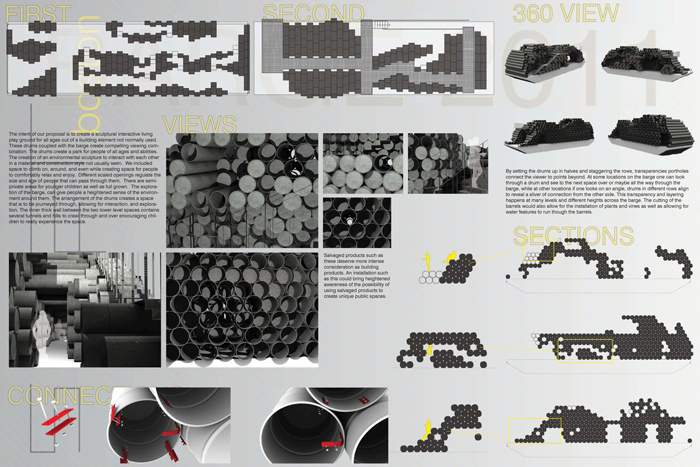 A musical playground for all ages, this design incorporated drum-like pipes stacked on top of each other. Visitors would be able to pound on the drums to make noise as well as climb on them. 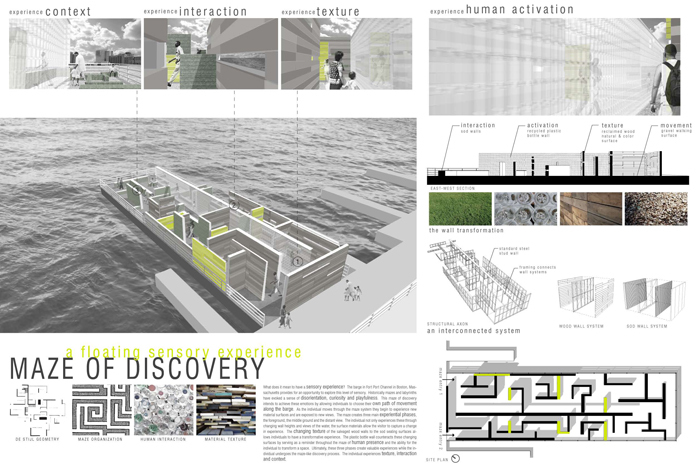 A wooden labyrinth and at the end of the maze, the visitor is awarded with a waterfront view at the edge of the barge. This design takes advantage of the cityscape view while being able to lay down. 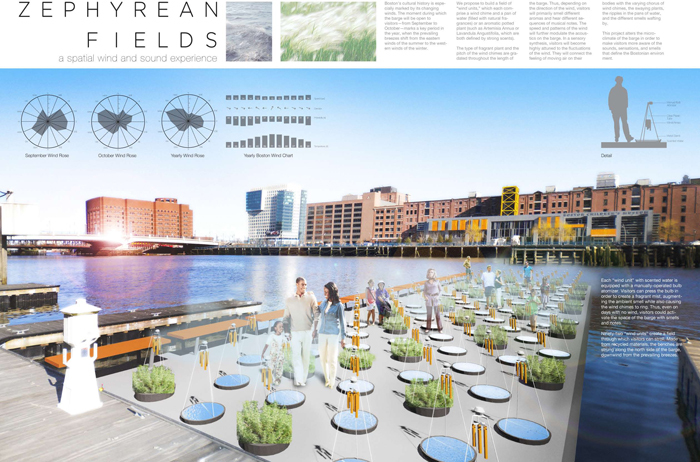 They proposed to install water filled balloons that are large enough for a visitor to lay on. Steam below the barge’s deck would cause the balloons to undulate giving the effect of waves. 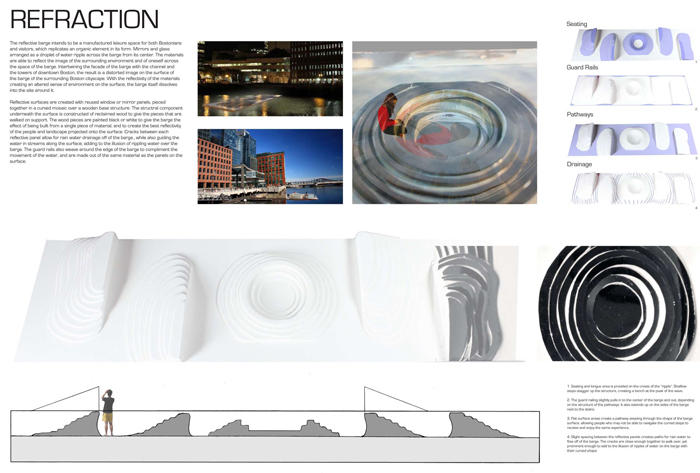 Mimic was designed to mimic the ocean and create the illusion of a never ending landscape. 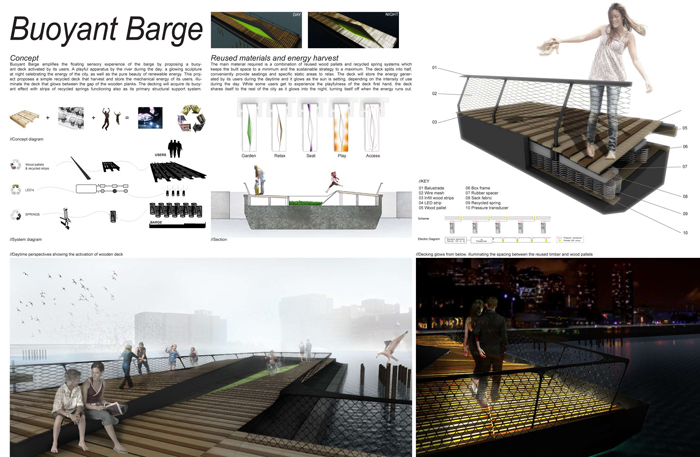 This design included covering the barge entirely in sea grass and constructing a hovering platform that would zig-zap over the grass. 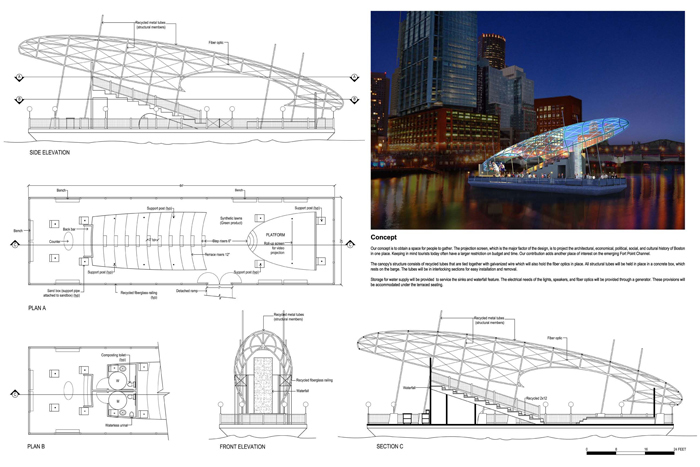 This design would create a large oval canopy over the barge. Underneath the canopy is stadium seating and a stage for small performances or movie screenings. A moving wooden deck placed over the surface of the barge. As a visitor walked or jumped the floor would bounce and sway as if it were on top of a wave. 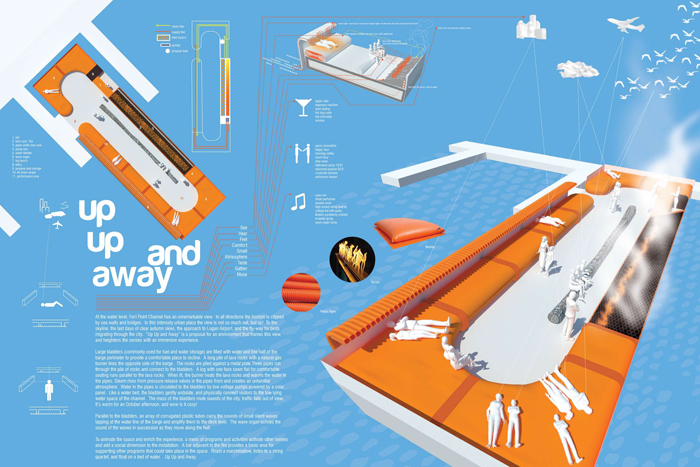 This design would use wind, sound, and smell to interact with visitors. 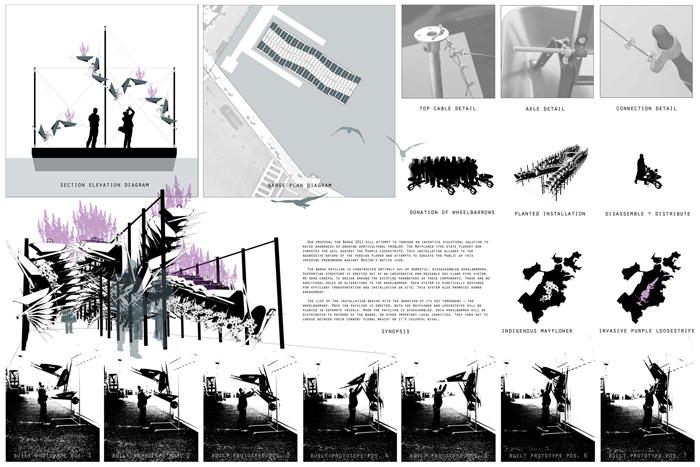 This design would have created 2 rows of hanging gardens made up of suspended wheelbarrows. In one row, mayflowers would be planted and in the other row purple loosestrife flowers would be planted. 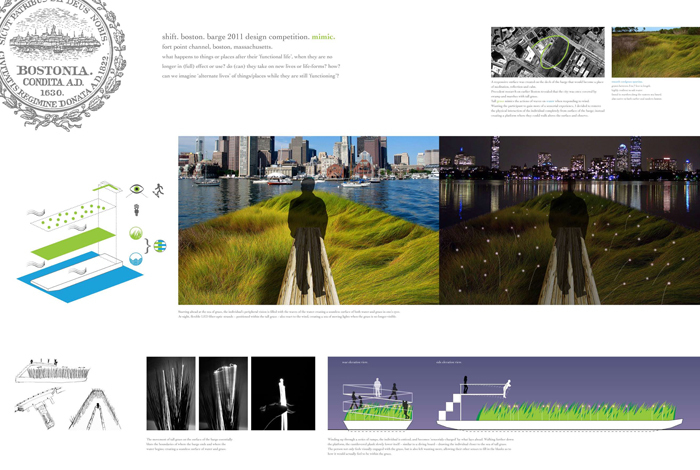 Refraction is designed to reflect the landscape. By covering the barge in layers of mirrors, the barge’s surroundings are copied and altered.